Many years ago I discovered the wonder of having a great dog walking purse. I discovered a great bag for dog walking – sort of a small messenger bag but with a lot of purse qualities and a lot of pockets – at a thrift store. I bought it thinking I would just use it when walking my dog but soon it became my everyday purse. I filled my perfect dog walking purse with everything I would need when out on a stroll and kept it by the door. It made it easier and more pleasant to get out for a walk. I could quickly jaunt out the door when motivation struck instead of searching around the house for my must-have items. And then it wore out. Searching for a replacement, I spent way too much money ordering purse and after purse hoping that it would be like the last one. But it wasn’t. It was too small to fit everything in; it was too deep to access things easily; it was too big and cumbersome; The strap kept cutting into my neck; or it didn’t have enough pockets. Disclaimer: This post contains affiliate links, which means I get a small commission if you purchase something (at no extra cost to you). Thanks for supporting us! THEN I found another small messenger-type bag that was just right – the To Go Convertible Bag by Haiku. The To Go Convertible mini messenger bag is just the right size – not too big or not too small. It looks like a purse and not some big utility bag. It has a lot of pockets – 5 on the outside and 2 on the inside. One of the pockets on the inside is big enough to hold a tablet or notebook and the other zips for security. The outside pockets are each big enough to hold a water bottle, my cell phone, sunglasses, or the like. In the inside purse pockets, I keep a mini notebook to write down blog post ideas or to-do items, a collapsible dog bowl, a bag of dog treats, hat and gloves or light sweater, sunglasses, wallet (also from Haiku), and small necessities like lipgloss, Shout stain wipes, and wet wipes. The best part about this bag though? The slip pocket on the flap. I put my dog poop bags in there so know right were to find them and they are easy to get to. Honestly, I put the full ones in there too until I can find a trash can. I’ve been doing it for months and the purse doesn’t soak up the stink at all (even if I forget it in there for a day *ahem*). The other awesome thing is that the the bag is made with 100% cyclePET fabrics made from post-consumer recycled beverage bottles, which minimizes damage to the environment by keeping plastic waste out of landfills and reducing the use of virgin petroleum. Other features include a water resistant lining and coating (important in the Northwest where it rains a lot) and a detachable & adjustable shoulder strap that lets you convert the bag into a backpack (that’s the convertible part). I will probably never use it that way but it’s a neat idea and would come in handy if you needed to make sure it was more securely on you while hiking or navigating obstacles. When my original dog walking purse died, I was left trying to find an alternative because that bag was discontinued. I’m extremely happy with the Hauku To Go Convertible bag. I even like it better than the first bag I used when walking the dog. I had high hopes for the durability of this one and I was right. After 3+ years, the bag showed hardly any wear. Unfortunately, the clip that hook on the shoulder strap that hooks to the bag broke. I was ready for a color change so I gladly ordered another one. I’m honestly not sure I’ll ever own a purse. This one is just the right size and holds everything I need it too, plus a little extra sometimes. I like the bag in black plum. Would go great with my coat and wouldn’t show dog park dirt. That’s why I picked the Cactus. I had another purse in a lighter color and it started to show the dirt from muddy paws. I ADORE Haiku bags!! I’ve been eyeing the convertible bag for a while now, actually! I would totally get it in Desert Bloom! I love them too. There are so many I would own. I have an old version of the Sprint Duffle I am really keen on the EveryDay Tote and Wisdom Work Tote bags. This looks awesome! I agree, a good dog mom purse is a treasure! I’m always looking for the perfect bag, so I’m excited that you love this one. I love both the Desert Bloom and Black Plum. Not sure which one I would choose! This is awesome!! 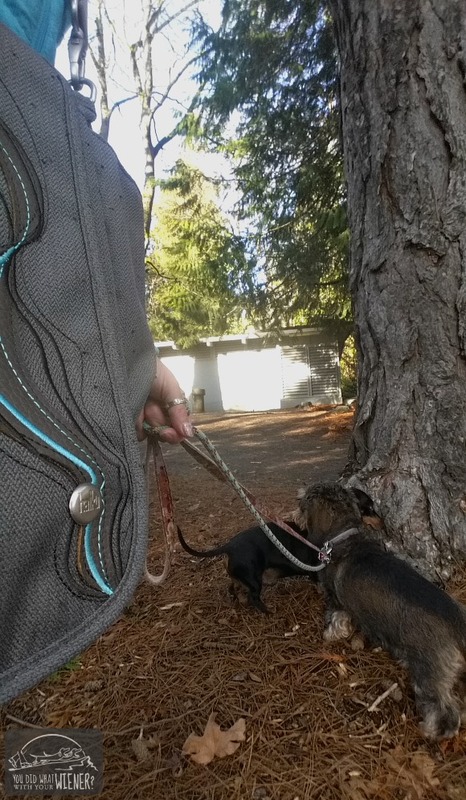 I always struggle with all my supplies when out with dogs, and a drawstring bag just doesn’t cut it most of the time. 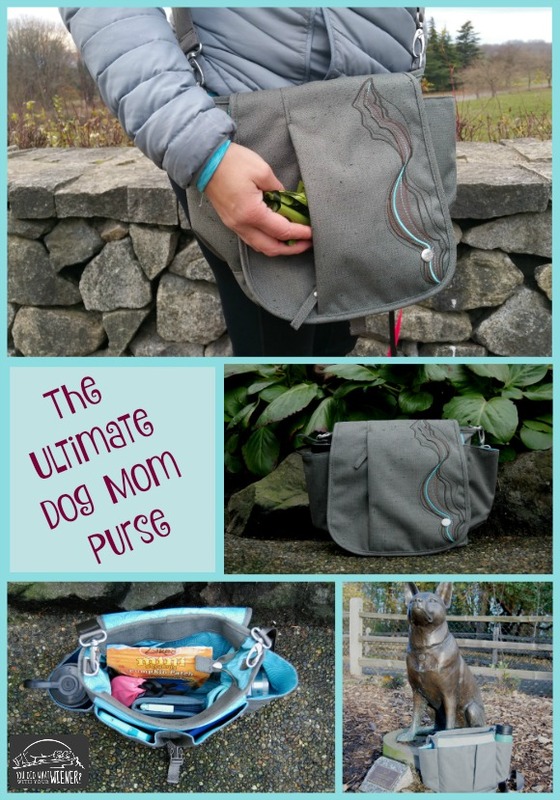 Believe me… I am picky when it comes to my Dog Mom purse. Everything before this has been frustrating in one way or another. The Desert Bloom is fun! I liked that one too and almost got it. I decided to go with a neutral color though. Turquoise is my color so I love the little stripe on this one. This is the ultimate fur mama purse! I love this! I just started looking into a great purse that I could use for my adventures with my mini doxie Butters and wow this is it! I love the black and plum color! Thanks for a great giveaway! I love all the pockets-especially the side ones big enough for water bottles. I would pick the black plum. I also like the strap. It seems difficult to find this combination these days. I too spend a lot of time shopping online for a useful purse. This would fit the bill. Thanks for doing the original search. Thanks Jess, Gretel, and Chester! Cool bag to compliment my two cool dachshunds, Bailey and Bella. That’s really cute! I have a couple dog bags but they are really cumbersome and not super useful. I mainly use a huge dachshund print canvas tote but then I end up digging for everything. River Floral Print would be my choice! Totally the Black Plum or the Cactus! Love these! I am picky about my bags as well and this one looks perfect! Good find! definitely desert bloom – why do anything else if there’s red available? I like the cactus or the black plum. I never thought of having a dog mom bag before, but with two babies now I know it would be super useful. I love the desert plum color! I mean Desert Bloom, haha. I love the Black Plum. I would choose cactus. Nice review, great bag! The perfect purse, every dogs moms dream. What a great looking bag. I would buy the dessert bloom. This bag would be a perfect travel bag with or without my dachshund. I recently bought another brand but it seems to big. This looks perfect! I love the “hideaway” on the front flap. With 2 dogs, I end up stuffing all my pockets when going out. This is a great idea, gotta have! I just love your bag. I can’t decide between the Desert Bloom or the River Floral Print. So it would be one of those, because they’re so fun. I would choose the desert bloom – beautiful color! This bag looks great and the prices are super reasonable too! Would love the cactus and hoping that it’s not sold out as it appears you can’t order that color right now. This is an awesome bag! perfect for dog walking or hiking. I personally would pick either Desert Bloom or Black Plum. Thank you for the tip on the purse! I would love the Black Plum! With three dogs, plus fosters, this would be an awesome addition to my bag arsenal. black plum! this bag is awesome. I understand about buying purses that don’t work. I can’t tell you how many I’ve gotten and been unhappy. This sounds like the perfect one. Thanks for the recommendation. And it’s really cool looking. I especially like the part about the poop not being absorbed into the material. Desert Bloom is my fav color for sure. And I could certainly use a new bag for doing dog stuff. My current purse is rather engulfed with dog stuff, which doesn’t do so well when I take that same purse to work! I like the Desert Bloom or the River Floral. I just checked out the pictures on their web site and this bag looks ideal. Absolutely the blue floral. I have small Haiku purse that I’ve been using for years – love it! Torn between the floral print and the Desert Bloom. I would love the black, because hopefully the dirt and dog hair won’t show too bad. I love that bag! Turquoise is also my color, so the stripe is a nice accent. I love Black Plum because it won’t show all the dirt that it gets on it especially when we go for hikes. This bag looks awesome! Would love the cactus! I love the black plum. Goes with everything. It really does look like a great bag. Thanks for the chance to win one. I love this bag! I ordered a bag from a catalog and I use it, but it slips off my shoulder constantly and has a fraction of the pockets that yours has. That thing is a beauty! Black plum so it doesn’t get dirty! This bag is awesome! I NEED one! Love the black plum color, and that it converts to a backpack. Brilliant! Oooh this looks great!! I think I prefer the black one, safe from muddy paws. I love the pink Desert Bloom color!! I would use a bag like this all the time! I would want the River Floral Print. So pretty! I love all the doggy uses 🙂 I take our rescue dog to the park every day, and this would sure come in handy! Thanks for the chance to win! Black for me and my four minis! I can relate with your search for the perfect dog mom purse. I’m regularly bringing my two out for adventures and am also looking for the perfect bag. Would love the Black Plum due to the “hide the dirt” feature. I would choose Desert Bloom. These bags are very nice. Nice! I just got a Haiku Leap to be my iPad mini purse. I love its blue floral pattern and that it’s made from recycled material! Nice review! I like the black one. Wow! That looks like an amazing dog purse! I could totally use something like that! I generally try to stuff everything into my treat bag and there is never enough room! I really like the River Floral print one! So neat! I like them all! I think black plum is my favorite though. Nice and neutral. Black plum would be my pick! I think my wife would really like the black plum one. I love the color you chose, grey with blue lining. Is that what they call cactus? I like all of them, but actually like the one in your pictures the best! I love the Desert Bloom bag. So pretty and practical. Currently I use a small reusable shopping bag when I go out for walks with my dogs. It’s not anywhere near as nice as this, plus it’s not hands free. This would be so awesome! Something neutral like dark plum or cactus. I like the black plum color! I would get the black plum! Great bag! I like the black plum color. Ooh, I’d love that gray version. Very smart and VERY practical-what a terrific product! I sell 31 bags and they don’t make anything like this!! I love it!! I guess I’d have to go with the floral one. i love the River Floral Print. I love my little Haiku purse, and that one looks even more awesome! I love the desert bloom and the black plum colors for the dag. I also like that the back looks really sturdy. A bag that can uphold going to dog competitions and camping is very important to me and hard to find. Thank you for the chance to win one. Color isn’t important! I just love the bag!!!! Could come in handy for many outings. Oooh. I love this, mostly because I love a good functional bag! With 4 dogs I need this! Love the black plum. I think I like the desert plum. Thanks! Way too cool of a nag! Red all the way! This bag looks great! Training Impulse and trying to keep up with all his stuff plus everything I need is hard to juggle. I could easily see me carrying this bag with my backpack and the color matches my backpack perfectly. Hi Jessica, I recently bought one of these convertible bags by Haiku. I love it. I’m a person who needs pockets and room without an overly large bag to lug around. Got it in the dessert cactus. What a beautiful color. I love that the handle is large enough to become a body bag so it won’t slip off your shoulder. Thanks for the review. I can’t tell you how many purses I go thru. They either don’t work out or they rip. what all do you keep in your doggie mom bag? Hi Alivia. Besides my wallet, cell, phone, keys, etc. I carry a small package of dog eye wipes (they work good for cleaning all kinds of messes), a bag of treats, poop bags, and sometimes a water bowl and bottle of water. It’s but enough that I can sometimes carry a jacket for my small dog too. Such a cute AND functional bag! Right now my pockets are my purse while I walk the pooches! I like the idea of having a bag dedicated to my dogs. Great article!